At present, the dialysis technology in development shares a common theme: simplicity for users and connectivity for staff. The Schwartz Center for Compassionate Healthcare is a national non-profit organisation dedicated to strengthening the relationship between patients and caregivers, and preserving the human connection in healthcare. Its programs to advance compassionate, patient-centred care have been adopted by more than 400 hospitals and other healthcare institutions in the U.S. and UK. In 2015, a new regulation 188/15 was introduced under the Excellent Care for All Act that requires hospitals to “engage patients and their caregivers in designing, reviewing and maintaining ... processes for receiving, reviewing and attempting to resolve expeditiously complaints from patients and caregivers.” Baxter Health Care was taking orders on its new Amia PD cycler. Like other machines manufacturers, Baxter wanted the Amia to be simpler to use, lightweight, and offer technology that connected patients and caregivers. Its Shared Source is a GPS of sorts that helps staff monitor patients while on the cycler. Growth in the number mergers and consolidations between hospitals is expected to have a high impact on the revenue generation of medical device manufacturers. A large number of hospital networks are operating under one organization. These networks can leverage the price of the medical devices with the manufacturers and thereby reduce profit margins. In February 2017, Fresenius Medical Care announced the acquisition of a majority stake in Cura Group (“Cura”), a leading operator of high-quality day hospitals in Australia. Cura provides a variety of specialised ambulant services, such as ophthalmology and orthopaedic surgeries, in an outpatient setting. Cura was established in 2008 and generated a revenue of AU$127 million (€87 million) in the financial year 2015/2016. This acquisition allows Fresenius Medical Care to further leverage its core competence in operating outpatient facilities, extend its dialysis network and thereby lay the foundation for future growth in the Australian market. Companies are subject to a number of existing laws & regulations and non-compliance, which is likely to adversely affect their business, financial condition and results of operations, and companies are susceptible to a changing regulatory environment. As participants in the healthcare industry, the operations & products of companies as well as customers are regulated by numerous government agencies globally. The impact of this on the company is direct to the extent that companies are subject to these laws and regulations, as well as indirect in a number of situations. In many instances, the companies may not be directly regulated by specific healthcare laws and regulations, however, their products must be capable of being used by customers in a manner that complies with those laws and regulations. Government and regulatory bodies of various countries are adopting cost-containment measures to reduce the healthcare burden. This shift from volume- to value-based systems is driven by various measures taken by governments, healthcare providers, insurance payers and life sciences companies, which include outcome-based pricing, profit & risk sharing, price control and competitive tendering. The value-based healthcare system will help achieve the maximum value for money spent on healthcare, and thus improve outcomes through integrated care pathways. At the same time, it will levy pricing pressure on biopharmaceutical and medical device companies and is likely to impact investment in the R&D of innovative medical treatment technologies. The competition section of the Continuous Renal Replacement Therapy (CRRT) market report features profiles of key players operating in the market based on their market shares, product offerings, differential channel strategies, marketing initiative, product reach and company dashboard. Some of the key players featured in the report include Fresenius Medical Care AG & Co. KGaA; Baxter International Inc.; B. Braun Melsungen AG; Medica SpA; Nikkiso Co., Ltd.; Nipro corp.; Toray Medical Co., Ltd.; NxStage Medical, Inc.; Asahi Kasei Corp. and Medtronic plc. Key Players operating in the CRRT market are focused launching novel product lines due to the growing demand from AKI patients. These companies are taking continuous efforts to provide cost-effective CRRT systems in the Asian market. According to WHO, the general availability of kidney dialysis is 60% in countries worldwide. Its availability is significant in high-income countries and is found to be 93%, whereas its availability in developing and under-developed countries is 46% and 27% respectively. Fresenius Medical Care AG & Co. KGaA, one of the leading providers of dialysis products and services, has launched multi-FiltratePRO, a therapy system for Continuous Renal Replacement Therapy (CRRT), for the treatment of acute kidney failure in critically ill patients at intensive care units. Some of the key manufacturers of continuous renal replacement therapy are focusing on novel marketing strategies to increase their product reach in the Asian market. Price reduction strategy in consumables will be the critical success factor for leading providers. These companies are receiving fierce competition from local suppliers of consumables. These supplies have a strong hold on conventional distribution channels such as wholesalers and retailers. Renal replacement therapy includes dialysis (haemodialysis or peritoneal dialysis, hemofiltration and hemodiafiltration), which is the filtration of blood with or without a machine. CRRT is widely used for acute kidney injury. CRRT is a dialysis modality used to treat critically ill and hospitalised patients in intensive care units who develop Acute Kidney Injury (AKI). Unlike chronic kidney disease, which occurs slowly over time, AKI often occurs in hospitalised patients treated in an intensive care environment, and it typically occurs over a few hours to a few days. FMI has conducted a research study on the continuous renal replacement therapy market for the forecast period of 2017 to 2027. The report offers a comprehensive evaluation of the business opportunities prevailing in the continuous renal replacement therapy market along with insights on the consumption trend, market dynamics, disease incidence, reimbursement, patient awareness level, pricing, company penetration and market competition. The report elaborates on the macro-economic factors influencing the dynamics of the continuous renal replacement therapy market and its futuristic potential. The report offers a comprehensive taxonomy of the continuous renal replacement therapy market based on product type, end user and region. Continuous renal replacement therapy is sold in two types: systems and consumables. The consumables segment covers various types of hemofilter sets, solutions and other accessories. Increased healthcare spending across emerging economies is expected to encourage the establishment of new multi-specialties in dialysis centres and hospitals, which is, in turn, expected to promote the demand for CRRT. The continuous renal replacement therapy market has been analysed across various regions, which include North America, Latin America, Western Europe, Eastern Europe, Asia Pacific Excluding Japan, Japan and MEA. What is role of regulatory authorities and insurance service providers in the market? What is the revenue potential of generic continuous renal replacement therapy in the regions of North America and Asia? Who are the key competitors and what are their portfolios in the continuous renal replacement therapy market? What is the price point for continuous renal replacement therapy manufacturers in developed countries? For answers to all the possible questions required for gauging the performance of the continuous renal replacement therapy market, get in touch with our expert analysts. FMI has analysed the size of the continuous renal replacement therapy market by using the triangulation methodology in which we have tracked the revenue of key players operating in this segment. Key players are segmented at a tier-level with respect to their revenues, product portfolio and geographical presence. This process involves the analysis of various company investor presentations, SEC filings, annual reports, earning call transcripts, 10k reports and press releases. This task is done to fetch substantial information about the key players, their respective revenues and estimate their respective market share. The forecasting of the continuous renal replacement therapy was conducted based on several macro factors such as the per-capita healthcare spending, per-capita pharmaceutical spending, the availability of reimbursements, patient awareness and other macro factors associated with the healthcare industry. A recent market study published by Future Market Insights (FMI) – “Continuous Renal Replacement Therapy Market: Global Industry Analysis & Opportunity Assessment 2017-2027” consists a comprehensive assessment of the most important market dynamics. On conducting a thorough research on the historic as well as current growth parameters of the continuous renal replacement therapy market, the growth prospects of the market are obtained with maximum precision. The report features unique and salient factors that are likely to have a huge impact on the development of the continuous renal replacement therapy market during the forecast period. It can help market players modify their manufacturing and marketing strategies to envisage maximum growth in the continuous renal replacement therapy market in the upcoming years. The report provides detailed information about the current and future growth prospects of the continuous renal replacement therapy market in the most comprehensive manner for the better understanding of readers. The report commences with the executive summary of the continuous renal replacement therapy market report, which includes the summary of key findings and key statistics of the market. It also includes the market value (US$ million) estimates of the leading segments of the continuous renal replacement therapy market. Readers can find the detailed taxonomy and the definition of the continuous renal replacement therapy market in this chapter, which will help them understand the basic information about the continuous renal replacement therapy market. This chapter covers the global market value and volume forecast from 2017-2027 along with the regional-level pricing analysis scenario. 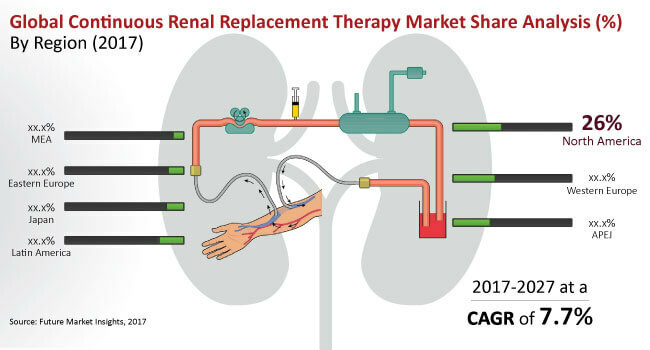 Readers can find comprehensive information about key market drivers & restraints along with recent illustrations of the continuous renal replacement therapy market. In this chapter, the readers will gain insights on the qualitative aspect of the continuous renal replacement therapy market. Based on the product type, the continuous renal replacement therapy market is segmented into dialysis systems and consumables. In this chapter, readers can find information about key trends and developments in the continuous renal replacement therapy market and market attractive analysis based on the type dialysis systems. In this chapter, readers can find information about key trends and developments in the continuous renal replacement therapy market and market attractive analysis based on the product type for each region. Based on the end users, the continuous renal replacement therapy market is segmented into hospitals, and dialysis centres. In this chapter, readers can find information about key trends and developments in the continuous renal replacement therapy market and market attractive analysis based on end users. In addition, readers can find information about key trends and developments in the continuous renal replacement therapy market and market attractive analysis based on the end user for each region. This chapter explains how the continuous renal replacement therapy market will grow across various geographic regions, such as North America, Latin America, Western Europe, Eastern Europe, Asia-Pacific Excluding Japan (APEJ), Japan and the Middle East & Africa (MEA). This chapter includes a detailed analysis of the growth of the North America continuous renal replacement therapy market along with a country-wise assessment, which includes the U.S. and Canada. Readers can also find regional trends, regulations and market growth based on product type, end user and country of the continuous renal replacement therapy market in the North America region. Readers can find detailed information about factors such as, pricing analysis and market dynamics impact analysis, which are impacting the growth of the Latin America continuous renal replacement therapy market. This chapter also includes the growth prospects of the continuous renal replacement therapy market in leading Latin American countries such as Brazil, Mexico, Argentina and the rest of the Latin America region. Important growth prospects of the continuous renal replacement therapy market based on its product type and end user in several European countries, such as Germany, France, Italy, Spain, UK, BENELUX and the rest of Western Europe, is included in this chapter. Important growth prospects of the continuous renal replacement therapy market based on its product type and end user in several European countries, which include Russia, Poland, and Rest of Eastern Europe, is included in this chapter. Great China, India, ASEAN, Australia and New Zealand are the leading countries in the APEJ region that are the prime subject of assessment to obtain the growth prospects of the APEJ continuous renal replacement therapy market in this chapter. Readers can find thorough information about the growth parameters of the APEJ continuous renal replacement therapy market during the period 2017-2027. Readers can find important factors that can make a huge impact on the growth of the continuous renal replacement therapy market in Japan based on the market segmentation during the forecast period. This chapter provides an overview of regulations, drivers, restraints and trends in the Japan continuous renal replacement therapy market. This chapter provides information on how the continuous renal replacement therapy market will grow in the major countries of the MEA region, such as GCC Countries and South Africa, during the period 2017-2027. In this chapter, readers can find a comprehensive list of all the leading stakeholders in the continuous renal replacement therapy market along with detailed information about each company, including company overview, revenue shares, strategic overview and recent company developments. Market players featured in the report include Fresenius Medical Care AG & Co. KGaA; Baxter International Inc.; B. Braun Melsungen AG; Medica SpA; Nikkiso Co., Ltd.; Nipro corp.; Toray Medical Co., Ltd.; NxStage Medical, Inc.; Asahi Kasei Corp. and Medtronic plc. This chapter helps readers understand the research methodology followed to obtain various conclusions, important qualitative information and quantitative information about the continuous renal replacement therapy market. Haidylina for Advanced Medical Industries.